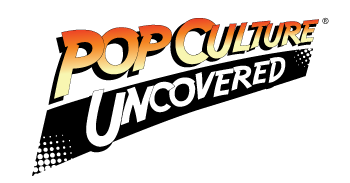 I’m taking over this week’s Tabletop Tuesday, and…I’ve got a confession. As this site’s resident Catholic, I’m driven to give myself a flogging over this week’s review. You see, the good folks at Golden Bell Studios gave me a review copy of Pretending to Grownup weeks ago and I’m just getting to it now. Well, it’s almost Advent, so it’s a time for repentance. I plan to punish myself by swallowing the game’s Unipegasaurus token and letting it do what it must to my bowels. It might hurt, but like the man says: this, too, shall pass. Life is hard, and never more so than when you move out of your parents’ home and have to deal with real life: bills, dinner, time management, and trying to squeeze in nuggets of entertainment while pretending your bank account isn’t being drained. Pretending to Grownup from the growing Golden Bell Studios offers a chance to take a cockeyed look at the things we do to eke out a living. This stuff is all serious, but somehow, running it through Megan “Doodle for Food” McKay’s artwork makes it a lot more bearable. 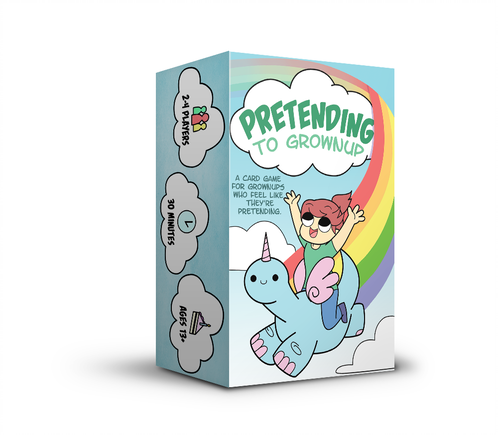 Pretending to Grownup is a card game which, on the surface, is a game of chance and strategy, probably good for a night of drinking and carousing during a reunion with your college pals. Players shuffle a deck of cards with random values of “time,” “money,” and “energy,” referencing the three things adults never have enough of. Players then “squabble” over who has the most of each on their card, with whoever holding the most getting to keep all the cards in competition and earning a point for each. Squabbles can grow if the challenged player decides to argue with the player next to them, inviting a three-to-four person argument. Alternatively, a player can “ignore the problem,” in which case, the squabble never happens, but the challenger automatically gets a point. So, there’s some strategery involved here: do you take a chance on the player getting a free point, or do you engage in a grownup fight? Pretending to Grownup is complicated by the Unipegasaurus, an imaginary animal which represents all the imaginary things we’d like to have in life, but don’t. The Unipegasaurus token gives you a +1 bonus to your scores, but wastes a turn and can be stolen by another player who’s also willing to waste a turn. More fun are the Unipegasuarus cards, which can be played to hilarious effect. 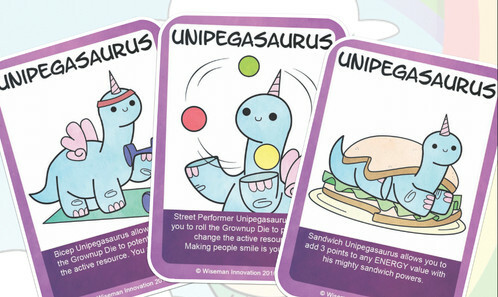 Maybe Date Night Unipegasaurus gives you a huge windfall to your money score, or the Never-Give-You-Up card turns a “1” card into a “10.” These cards can add an unexpected enhancement to a play that would otherwise be a sure thing. Current versions of the game include a bonus deck of special red Unipegasaurus (and other oddities) cards which can really mess with play. 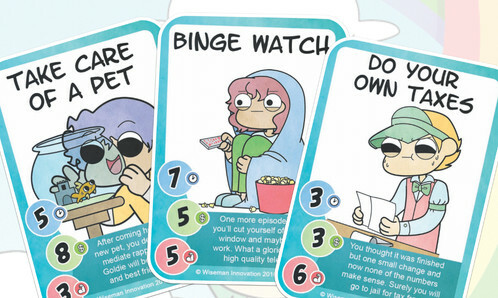 The treat with these cards is that they’re illustrated by artists from various popular webcomics, such as Dork Tower, Cyanide and Happiness (who offers a very useless card), Fowl Language, Awkward Yeti, and others. Look, if you like webcomics, these are hilarious. As far as card games go, Pretending to Grownup is a fine offering for a rapid play competition, particularly where alcohol is involved. The game only has two drawbacks (besides the price, which, honestly, is a problem for newcomers to the board game market–even Settlers of Catan is still priced way above Monopoly). One, the Unipegasaurus token isn’t particularly useful except as perhaps a moment of last-minute strategy. Claiming it wastes a turn, and a second player taking it removes it from play. The token could be useful in a last-minute emergency, but otherwise, it may never come into use. Second, there’s a drawback to the cards themselves. 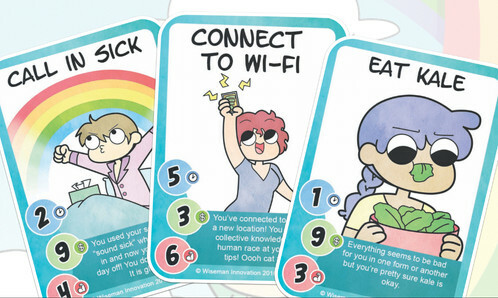 Most of the cards are a hilarious reflection on real life, and you will laugh at very basic things like “Do Your Own Taxes” and “Awkward Baby Hold,” because, ha!, people do these things and we’re proud of ourselves for being as competent as our parents. They’re funny, but they never really come into play other than for their point values. A “Suspicious of Neighbors” card is funny and we all do it, but you don’t really have time to reflect on that during game play. If the value cards had distinct features relevant to playing them, that would make sense. In reality, they’re something you’ll chuckle at before and after play, but not have time to use during the game. Otherwise, Pretending to Grownup is a cute offering, particularly for the under-30 crowd who is still trying to figure out how a mortgage works.